I stayed in my tent a little longer than I wanted because of the rain falling outside. It would seem to stop and I would get hopeful, but a few minutes later, it would just start right back up again. Fortunately, my sleeping bag remained dry. 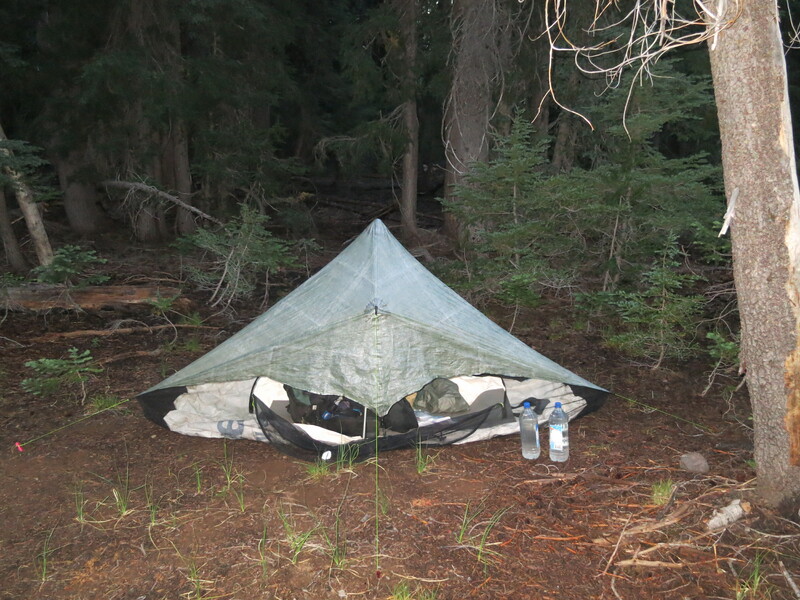 I ate breakfast, packed what I could inside my tent, and strapped my wet tent to the top of mypack. I hadn’t seen where Wall-E camped last night and saw no one pass by in the morning. The terrain was gentle as I started and then began to climb. A man with a huge backpack labored slowly ahead. When I passed him, he told me I would be running into a bunch of boyscouts ahead. The rain continued to come down. The scouts were much further up the trail than I had expected. I passed by them with their garbage bag covered packs and then sat on a wet slope and snacked in the rain. My body was cold. I couldn’t imagine that Baxter and Wildcat and their friend would choose to camp out in these conditions and not push for the store. Maybe I would see them there after all. About half way through the day, I ran into my third Southbounder. His name was Vogue. He told me that there were a bunch of people ahead of me (Yes, I know…) and that I was the 126th northbounder he had run into. He seemed to sense my dejection because he then said that I was still at the front of the pack! My eyes grew wide and a smile spread over my face. He said that the main pack was now between Chester and Etna and that most of those people would not finish. He also said that I am now in a lull in the trail, but that the last 700 miles will be beautiful. “You’ve hiked this trail before?”. Yes, he said that he had previously hiked it northbound. I was so happy to hear that it wasn’t just me who found this part of the trail boring! His southbound experience had so far been amazing. 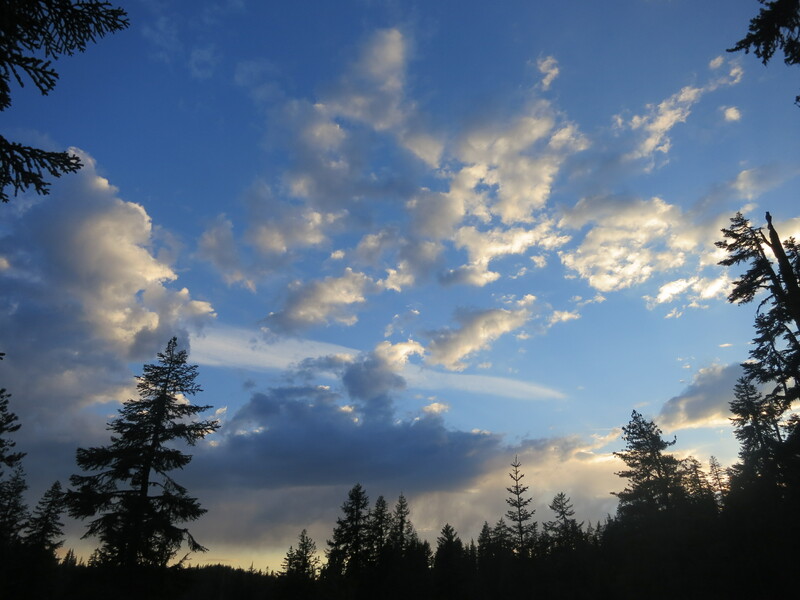 He had sunny blue skies for the entirety of Washington and could see many of the views that he had not been able to see on his northbound hike. After he left, my energy lifted a bit. His words helped counteract the constant rain. I wanted to write a message on Facebook that said, “You guys… I think I’m actually GOOD at this!!”. I always knew that I was fully capable, but hearing that I was toward the front of the pack, especially in my sick condition, made me think I had finally discovered what I excelled in. A few minutes later, I reached an intersection and stepped over a huge arrow drawn with sticks, as well as the letters “NO” and proceeded straight ahead, before I decided to double-check my decision… Whoops… I often want to take the path of least resistance. I headed on, feeling a bit better, but still wet and cold. I met a group of three, who I passed, and then found a place to sit on a steep embankment along the trail for another snack. Then, I plodded on. Because it was so wet out, I hardly drank any of the three liters of water I was carrying and as I got closer to the road, started dumping some out. At last, I reached the road and turned right to walk the mile down to the store. It was still raining. I hadn’t seen another northbounder all day, but suddenly, Viking overtook me on the road walk. I wasn’t sure where to turn down to get to the store. I had read that if we walk in on the road, that we have to pay an entrance fee to get in! At a certain point, I just cut down the bank and arrived at the restaurant and gift shop. I brought my pack into the entrance and was surprised to see Tumbleweed there! “No. It’s Forrest.” I asked Tumbleweed why he would call me “Man” and why there wasn’t a pause or a tone change between the two words. He didn’t understand it either, but found it interesting that I had had the same experience! The chicken sandwich started hurting my belly almost immediately after I finished it. When was I ever going to be able to eat a meal again? Finally, I took off my rain pants and saw the mud caked on my legs. “Just a tiny bit muddy” I said to a man sitting nearby before I headed back into the restroom to try to wash some of it off. I had planned on taking a shower and doing laundry here, as well, but I was running out of time. I decided that the surprise shower I was offered a couple of days ago made up for one here. By now, there was a large contingent of hikers gathered around the store. Baxter, Wildcat, and their friend, Susan had in fact come in, as well as Beer, Ranch, Viking, and several other hikers who had obviously skipped huge parts of the trail and hitched up here. Some were trying to figure out where to stealth camp, as all of the paying spots were now taken. Commando and Purple Haze were able to get the last RV site. I wanted to get back onto the PCT, so I headed out, not sure of how to get there. Fortunately, a ranger helped direct me to the side trail that lead back to the PCT. I climbed up the hill with my full pack and hiked until I reached the intersection with the PCT. There, I found a flat spot to set up my tent, eat a few snacks, and head to sleep. 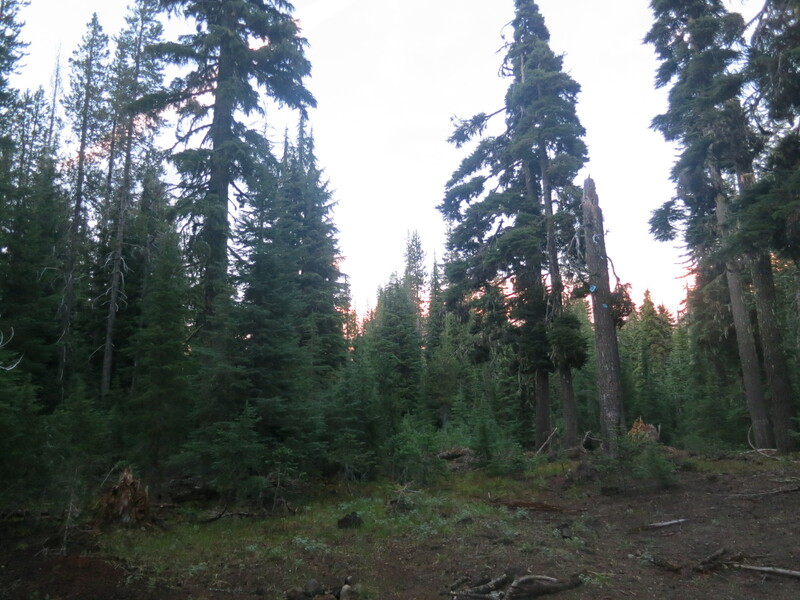 This entry was posted in Uncategorized and tagged Pacific Crest Trail, PCT, PCT 2013 blog, PCT thru-hike, thru-hiking by Wendy. Bookmark the permalink.